Shenzhen Maker Faire: Manufacturing hub is also home to the Chinese DIY movement. When you enter the offices of Seeed Studio, the first thing you see is a large mural that says, “Innovate with China.” Founded in 2008 by Eric Pan, Seeed Studio began as a two-person company in Shenzhen, a world manufacturing hub in southern China. Today, Seeed is the global leader in open hardware innovation, a 200-person business with more than $10 million revenue per year that offers services and products to the expanding maker industry. Eric Pan isn’t a graduate from an elite tech university like MIT, nor does he hold an international business degree. He grew up in Chengdu, Sichuan, and graduated in electrical engineering from Chongqing University. After college, he worked at Intel as a product engineer, responsible for quality control and new product integration, and later at Beamstream LLC as international sourcing manager. In 2008, the 26-year-old Eric envisioned that the expanding maker movement could be productively merged with China’s manufacturing expertise, and Seeed Studio was born. What started in a small apartment in Shenzhen has transformed into a new model of hardware innovation. Today, Seeed offers hardware kits, microcontroller platforms, and custom-made printed circuit boards to makers. It also provides highly personalized services. For example, Seeed enables start-ups to move quickly from an idea to mass production by identifying what Eric calls “pain points”—moments of transition, where a company lacks the knowledge how to scale up. Many hardware startups in areas like wearable computing, robotics, smart homes, and other cutting-edge areas have “innovated with” Seeed. And Seeed products have gained reputation worldwide. They’re offered for purchase not just online and on maker-specific platforms, but also at Radioshack—which gives the goods an opportunity to reach beyond the geeks in hackerspaces. As part of this Shanzhai culture, Seeed Studio has adapted an agile manufacturing process. Employees at Seeed work together in small teams of four to six people, who learn from one another, rather than performing the same repetitive task. They interact directly with customers through Seeed’s online service platform, an open innovation model inspired by Shanzhai and maker culture alike. 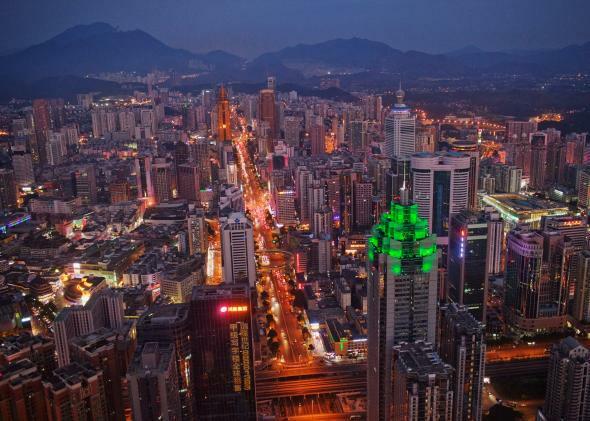 The last few years have seen an increase in hardware start-ups coming to Shenzhen to produce. (Notable examples include the Pebble Watch, which raised the largest Kickstarter campaign in history, and Oculus Rift, which got just recently bought by Facebook for about $2 billion in cash and stock.) There is also a growing number of foreign-funded hardware incubator programs such as HAXLR8R and Highway1, which provide additional support and incentive for makers to move into production. “Innovate With China” is the theme of China’s first major Maker Faire, is taking place right now April 6-7 in Shenzhen, with Seeed Studio as its main organizer and sponsor. It’s estimated that it will bring tens of thousands of makers in direct conversation with key players in China’s manufacturing world, including giants such as Intel and Foxconn. The Shenzhen Maker Faire constitutes an important moment that will show how “innovate with China”—and what began as the vision of a 26-year-old engineer from Chengdu—will scale in the near future. Future Tense is a partner in the Green Electronics Challenge, a competition for makers from the U.S., China, and elsewhere to create something new from electronic waste. For more information and to enter, visit the Green Electronics Challenge website.